Since 2015, we have seen a recurring, unfortunate failure pattern in many companies who want to adopt DevOps practices. The company hears about DevOps, learns about how it increases quality and efficiency, how it reduces waste, and how it improves product processes radically. They read about DevOps tools, processes, and the mindset to achieve this wonderful state. And then, they only focus on the setting up the tools and waiting for a miracle to happen. And to no one’s surprise, that miracle never happens. We have also seen the opposite. Quite a few companies successfully managed their DevOps transition and became much better at solution delivery. The difference between the companies that have succeeded in their DevOps transition and those who are struggling is simple: Their approach to change. Companies that have succeeded in their DevOps transitions looked beyond the tools; they focused on a broad set of areas such as technical practices, skills, continuous improvement, learning, culture, and employee motivation. That is, they did not focus on the DevOps tools and automation only; they considered many aspects surrounding the change. They prepared themselves for the change holistically. Managing a change holistically is not hard. There are many mature change management frameworks that identify the elements of successful change, ADKAR is one of those frameworks. We have observed a good coverage of ADKAR principles in companies that have succeeded in their DevOps transition. We have compiled a list of behaviors and attitudes from these companies that lead them to great results. We present these behaviors and attitudes here under the ADKAR principles. The first A in ADKAR stands for Awareness. The teams who are going to undergo the change should be aware of the nature of the change and why it is necessary. Many teams build this awareness for DevOps by following conferences and articles online. More aware teams benchmark themselves against leading companies and see where they are lagging (We can help you with this ) Another good way to increase awareness is to attend meetups and to exchange experiences with other companies on their transition journey. D stands for the Desire to carry out the change. Once the teams are aware of the nature of the change, it is critical that they show desire to change. This is the most challenging component in change management. Desire for the change can be forced with external incentives only to a certain extent. It is up to the change leaders to speak to the heart and the minds of impacted teams. Management can support the change leaders by offering some incentives, coupled with full support in execution and genuine motivation. Once the teams understand the reasons behind the change and they are willing to push forward with it, they need to know what they need to do and how they will do it. This knowledge can come in many forms. For example, clear work plans, lean project management methods with small teams, clear lines of communication, transparency... all count as good sources of knowledge. If the team is lacking the informational background to do their part, training and coaching could be a part of this phase. Knowing what to do and doing it are two different things. Once the team knows what they will be doing, they need support and space to carry out the steps for the change. Making the change tasks a priority, scheduling the necessary briefing and debriefings, not letting other work get in the way of the critical change tasks are important. Managers and leads have a big responsibility to ensure that the change tasks remain as top priority. If necessary, on-the-job training such as pair programming or mentoring could be very useful during this stage. Reinforcement ensures that the change is successful. After the change tasks are carried out, it is important to know whether the change was effective. For example, if the team agreed to merge their work at the end of each day, are they actually doing so? And by doing so, are we seeing the overall improvements we assumed before the change? Key performance indicators and dashboards, coupled with follow-up discussions about deviations are very useful ways to reinforce the new behavior. It is important to use more leading indicators than lagging indicators, so that the team knows in advance if there is a problem. Agile ceremonies, improvement katas are also useful reinforcement techniques. Last but not least, formal recognition by management would help a lot with rewarding and reinforcing the new behaviors. Making organizational changes are rarely as simple as setting up a tool or announcing the adoption of a new process. The change must be thought throughout, planned with parties that are affected, and followed through afterwards. Without these holistic steps, the change will not last and will probably not satisfy the goals set at the beginning of the change cycle. This is the reason why organizations cannot become successful at DevOps by just setting up Docker, Jenkins and Kubernetes. Or by hiring a few engineers and siloing them to automate tasks. The change needs to be holistic at the organization level, not only at the tool level. 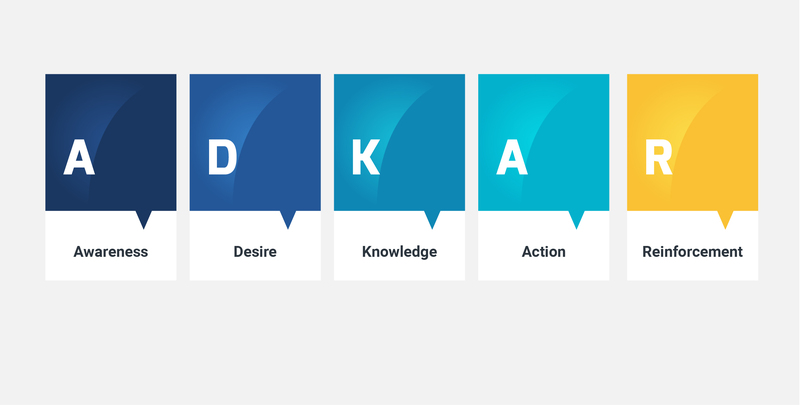 ADKAR model helps organizations in making lasting, successful changes by helping them identify the context of the change, the necessary actions to enact the change, and the required follow-ups to monitor the health of the change. It can be applied to many types of change, including IT-centric changes, such as DevOps transitions. It reminds us to consider the wide implications of the change, rather than just a small portion of it.